Windows XP is now-a-days getting out dated. But if you still have not switched to Windows Vista, then this post is going to be very useful to you. If you are stuck up with the boot screen and have forgotten your password, then read this and recover your password. When you start the computer, after the memory counting process, press F8. After that you will be asked a number of options. From that select Safe Mode. After that, go to administrator at the log on screen. Now go to Control Panel and select your user account. Congratulations, now you can log in to Windows XP without password. It's not that easy dude! 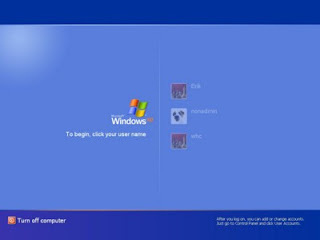 It is possible only if the person who has installed the windows had not entered the password while installing windows. If He had taken care of it, you cannot log in as an administrator in Windows XP. In your case, You are just lucky, that's all.